The men’s basketball team posted a rocky start to the second semester, going 1-2 in a critical stretch of the season. With only three conference games remaining, the Cardinals defeated Bates before losing two close games against Tufts and Connecticut rival Trinity. As a result, Wesleyan has fallen to fifth atop the crowded NESCAC standings (one game behind Hamilton and Amherst, and two behind Williams and Middlebury), and has dropped out of the NCAA DIII top 25 altogether. The good news is that the Red and Black have plenty of time to make up some ground over the next week, with three consecutive conference games on the horizon. This team, although young, is mentally tough enough to make a strong push to conclude the regular season. On Friday, Jan. 25, the Cardinals traveled to the Frozen Tundra (also known as Lewiston, Maine) to take on Bates. 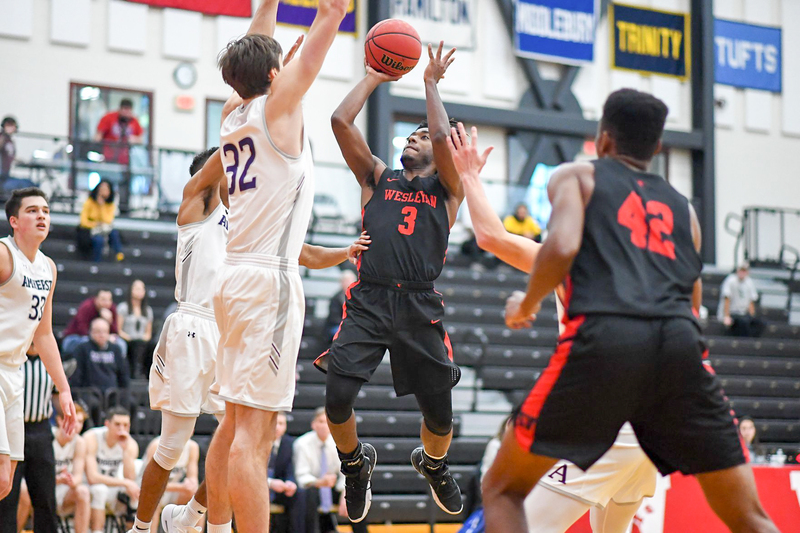 The college’s vaunted Cereal Wall wasn’t enough to defend against a sizzling Austin Hutcherson ’21, who dropped 35 points with the help of a school-record nine made three-pointers. The game was a tight one, swinging back and forth over the first and much of the second half. Eventually, the Bobcats couldn’t keep up. Hutcherson carved up Bates’ defense like Elbridge Gerry carved up the North Shore of Massachusetts, ultimately icing the game by scoring 16 in less than five minutes. Jordan Bonner ’19 lead the team in rebounds while also netting 18 points. All in all, the Cardinals shot 42 percent from three and held a 42-26 edge on the boards, winning with a final 85-75. The next game against Tufts, however, was a different story. The Jumbos dominated the first half, scoring 11 unanswered to take a 13-point lead after only five minutes of play. They would go on to lead Wesleyan 44-24 at the half. The Cardinals responded admirably, fighting back and cutting the deficit all the way down to two before Tufts hit two threes to clinch a 75-71 win. Joe DeLollo ’22 had a strong game with 14 points and eight rebounds. Coach Joseph Reilly had high praise of DeLollo and his fellow first-year teammates. The Cardinals met the Bantams of Trinity for the first time this year on Friday, Feb. 1 for the annual battle of supremacy over the Hartford metro area. This one was a thriller, featuring 13 lead changes and five ties as the game came down to the final minutes. Down five with five remaining, the Cardinals embarked on a 6-0 run, highlighted by a Jordan James ’21 alley-oop off the assist from Hutcherson. Unfortunately, the Bantams would eventually put the game away at the charity stripe, winning 75-69. Although both teams shot nearly identically from the floor (28-64 for Trinity and 28-63 for Wesleyan), Trinity had an exceptional night at the free-throw line, shooting 14-16. At risk of sounding like Tommy Heinsohn, this was a game where fouls made the difference. As the regular season winds to a close, it’s time to take stock of how the freshman class has been feeling about their first season of collegiate basketball. DeLollo also spoke highly of his teammates, who helped him in adjusting to college basketball. In addition, both freshmen had high praise for the three captains of the team: Bonner, JR Bascom ’17, and Kevin McDonald ’20. “I can’t stress enough how important the captains have been in leading this team,” Ravetz said. “Our captains…have had to lead us through some tough stretches this season and they have always stayed positive and kept us focused on our long-term goals. Needless to say, if the Cardinals have championship aspirations, this next stretch is crucial: a tough Amherst team on Feb. 5, followed by a regular season-ending home stand against Colby, and finally, the fierce Bowdoin Polar Bears. Despite the recent skid, Reilly is confident in his team.